During the tasting at B&O American Brasserie last month, chef Matthew Kane told us that his brussels sprout dish was inspired by one he tasted at Geoffrey Zakarian's now-defunct South Beach restaurant, Tudor House. It involved creme fraiche, mustard, and apples, and Kane borrowed heavily from those elements to create his own version. I happened to find Zakarian's recipe (posted on his Facebook page) and was determined to make something that resembled Kane's. Sorta. Kane's version involved bacon. I didn't want to buy bacon because I'd feel compelled to make the entire package and then eat the entire package, so I used the pancetta from Zakarian's version (which comes in much smaller amounts and thus is somewhat less lethal). It was hard to tell that Kane's version had creme fraiche on it at all, but if I had used the same proportion of sprouts to sauce in Zakarian's version, my sprouts would have been white and soupy. (As it turns out, my local supermarket didn't have creme fraiche at all, so I used sour cream.) 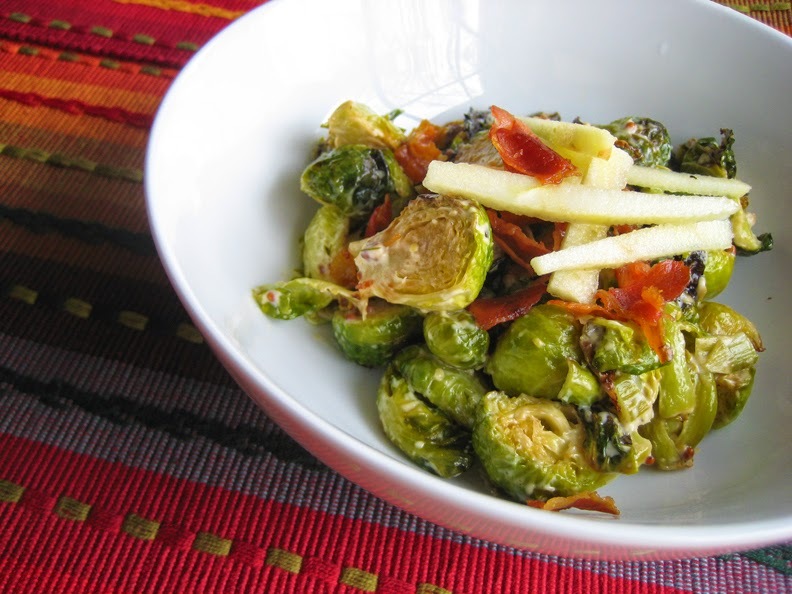 Zakarian's recipe also called for deep-frying both the sprouts and the pancetta. While that's nice to do if one has a fryolator handy, there's no reason for a home cook to deep fry vegetables when oven roasting does a swell job of producing crispy and flavorful near-burnt bits. And Zakarian's recipe called for two apples, which is an insanely large amount for something that is basically going to be used for garnish. After all, 8 cups of brussels sprout halves shrinks down to about 4 or 5 cups after cooking, and a medium-sized apple produces almost a cup of julienne pieces. He also calls for a cup of apple cider to be reduced down to one tablespoon. It's spring, so cider isn't available. Also, that seems somewhat wasteful for a home cook. Just use something else flavorful and sweet, like agave syrup. My version, with all of its adjustments, was pretty good. I think I preferred Kane's use of bacon over Zakarian's pancetta, and the vinegar flavor wasn't as obvious in Kane's version. If you put my dish and Kane's side by side, I'm sure there would be little or no resemblance. After all, I'm not a professional chef! But still...I liked my dish, and I will definitely make it again (with bacon). Preheat the oven to 450°F. 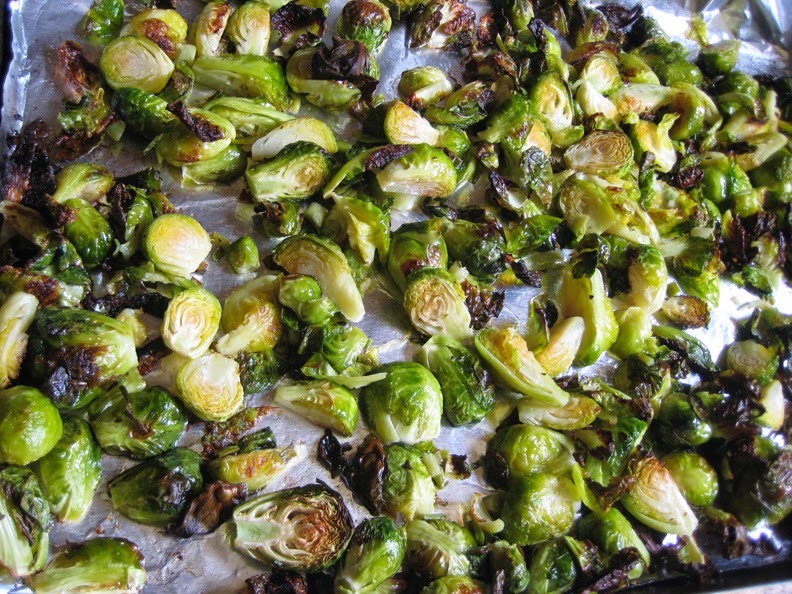 Place the brussels sprouts in a single layer on a foil-lined baking sheet with sides. Sprinkle on a few glugs of olive oil and a couple pinches of salt and toss well with your hands to make sure everything gets coated. Place the pancetta on another foil-lined baking sheet with sides. Put both pans in the oven. After about 5 minutes, using tongs, stir the brussels sprouts and flip the pancetta pieces. After another 3 minutes, remove the pancetta from the oven. It should be browned and crisp (if it seems more greasy than crisp, a few minutes of draining on a paper-towel-lined plate should crisp them up). Continue cooking the sprouts, turning them occasionally, until they are tender and the leaves have brown spots and some are brittle and crispy (mmm!). Remove sprouts from oven and place into a large bowl. Combine agave, sour cream, mustard, and vinegar in a bowl. Season to taste. 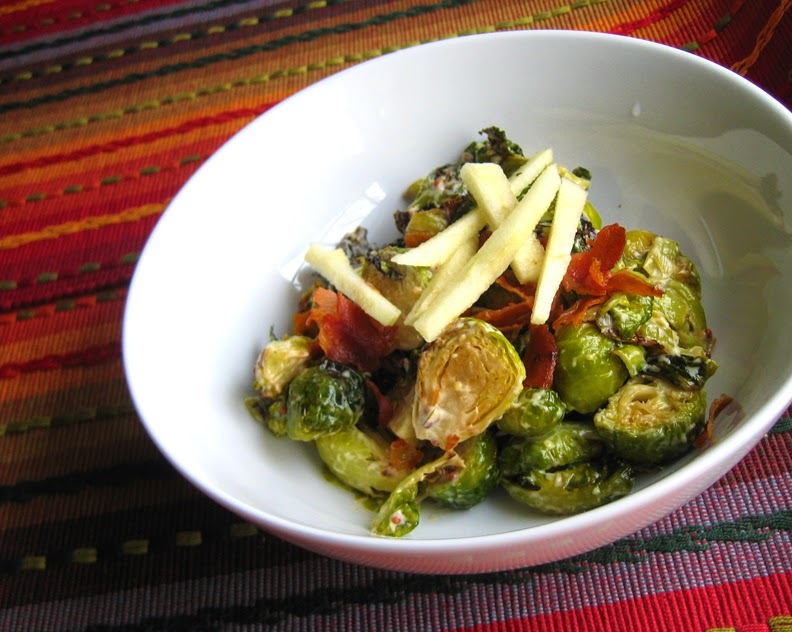 Toss sauce with brussels sprouts. Top with pancetta and apple. Serve immediately.